The underground Museum of the Great Famine by Nizio Design International in Kyiv, Ukraine, will be topped by two misaligned green roofs, writes dezeen.com. It will be dedicated to the millions of victims of Holodomor, or the Great Famine – a manmade famine in the former Soviet Ukraine from 1932 to 1933.The 14,000 square metre Museum of the Great Famine, which will be the “largest museum project” in the country, is being designed by Polish studio Nizio Design International in collaboration with the Ukrainian design studio Project Systems. 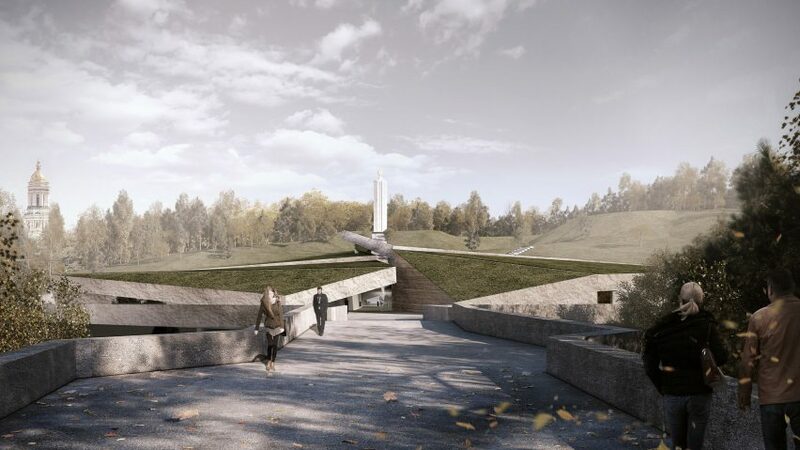 It will sit on the same axis as the capital city’s existing Holodomor museum and candle-shaped memorial. It will have a “tectonic” form created with an angular split roof atop heavy concrete walls that descend down to the subterranean exhibition spaces. “The starting point for the design of the Museum of the Great Famine is the concept of blending it into the tectonics and landscape of the Dnieper valley slope, near Pechersk Lavra, a place of unique importance in the history of Ukraine,” explained the Warsaw-based studio. This entry was posted in Excerpts and tagged design, Holodomor, Kyiv, Museum, Ukraine. Bookmark the permalink.